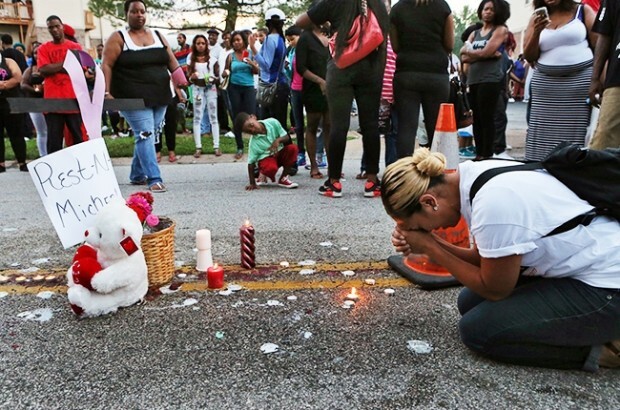 What’s Left To Say About #Ferguson? Guest Post by Joelinda C.
Until now, I have kept quiet about #Ferguson. It feels like so many things (too many things) have been said: Things I am encouraged by and things that I can whole-heartedly “AMEN.” Things I am not quite sure what to do with and things that make my blood broil [no point in linking to that nonsense]. A well-respected friend of mine went to the protests – I am riveted by what he writes, but I also appreciate this perspective on why marching is not the answer. 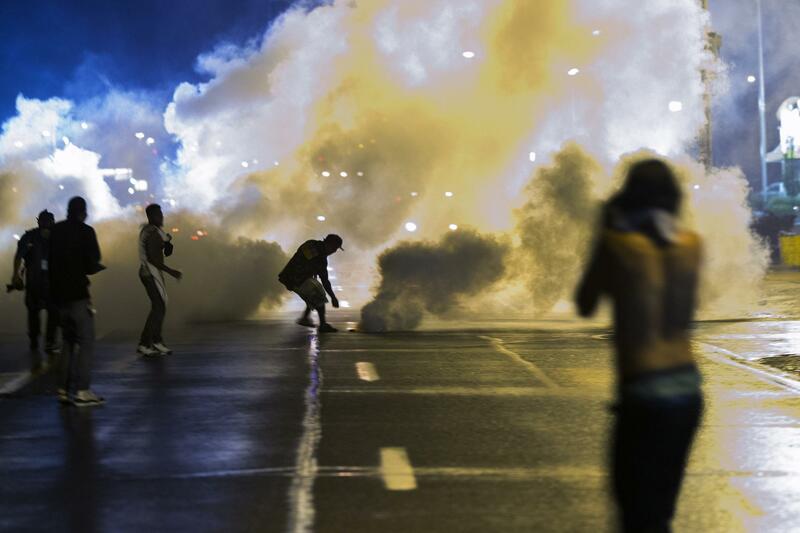 A lot is swirling around #Ferguson. More than I can read and process, let alone respond to. So I have been propelled inward – maybe out of self-protection, definitely out of despair, but also out of Providence. And silence is all I have been able to muster. But then something happened that finally forced my fingers to the keyboard. The other day, I took a drive up Route 1A – to get away, be with God. The pull of the big blue sky, my deep hunger to behold beauty and clear my head drew me to the open road. I wasn’t disappointed. Route 1A snakes northward and winds along the edge of the ocean. The crescendo of the drive is in North Hampton, New Hampshire. The breathtaking ocean vista clears concern and inspires hope and peace. I was overtaken and I parked on the side of the road in order to take it in. I was in shock. But only sort of…after all #Ferguson had been swirling around my psyche. But that was the first time that I, personally, was the target of such pointed racism and sexism. It was bound to happen eventually, I guess. I got back in my car and continued to drive. There is a time and a space to decry injustice. My #NewHampton experience calls for it. But #Ferguson infinitely more so. I wish this were more universally understood and accepted – I mean: why are we even arguing about it? But, #Ferguson has also forced me to examine me. And, even as a “victim” – #NewHampton forced me to examine me. The other day, a young man ascribed two descriptors to me. I’m not sure why he felt the need to yell them out the car window at me (I have some guesses…). But the reality is that he needed to order his world by categorizing me in the simplest, and most demeaning way he could. I do this to people, too – in my own way. To be honest, before being harassed in New Hampton I would have been more nervous about a car filled with young black males driving by than my white assailants. Yeah…so, that’s painful to admit. But recognizing how, in many ways, I am just like them makes inward reflection essential. And it also makes continued silence on #Ferguson impossible. This seems like an appropriate time for a slew of disclaimers: Disclaimer #1 – I am not saying that what happened to Michael Brown is in any way on par with what happened to me. Disclaimer #2 – I took Sociology 101; I get victim blaming. I am not blaming myself or Michael Brown or anyone else for the evil that is perpetrated on them. But what I am trying to say is that, as Christians, #Ferguson should make us all examine our own hearts and come to terms with our ignorance and self-preserving categories. These are the roots of racism, sexism, prejudice – plain ol’ Sin. As we point out the flaws in the police, the government, the system, let Providence not allow us to forget to recognize the sin in ourselves. The fact that all of us are racist, sexist, selfish. Yeah, all of us: not just the guys who yell slurs from a passing car, not just the cops who kill unarmed black men. All of us – as in, me too. And when we recognize this, #Ferguson is not a problem over there – it is a problem of which we are all a part. When we own our own sin, #Ferguson is not a nuisance in our newsfeeds that we can’t do anything about, it is a problem that we have an active part in combating – each of us in our own way. When we are grieved over our own sinfulness, we are granted the ability to respond to #Ferguson with grace, truth and justice. It is much easier to stay silent in pre-occupied passivity, to yell ignorance from the safety of a moving car, to point to all the “facts,” to [insert your coping mechanism here], than it is to own your sin. At least….it was for me. But music is grace in the midst of weighty silence. My grace came through the refrain of the song “Faint Not” by Jenny & Tyler. May its words stir the hearts of Christians honest enough to say of #Ferguson “yeah, I do this to people, too – in my own way,” wise enough to believe that there is grace for even that sin, and courageous enough to do what the Lord is prompting to address prejudice. And may our reflections on #Ferguson spark change not just over there, across the country, or even a few blocks down the road, but deep within our own hearts. Otherwise, there’s nothing left to say.